A rapt audience at the first Town Hall listens to Kevin Gilbert (NEA) speak about institutional racism. 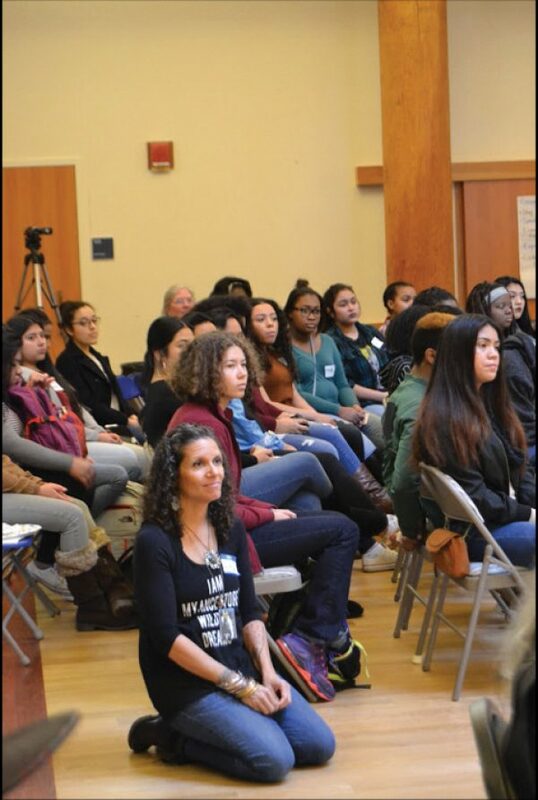 Standing in front of more than 120 predominantly African Heritage, Latino, Asian, and Native American students, Churchill High School teacher Jennifer Scurlock cited these New Business Items during the final “Lift Every Voice” Town Hall Symposium of the 2016-2017 school year. 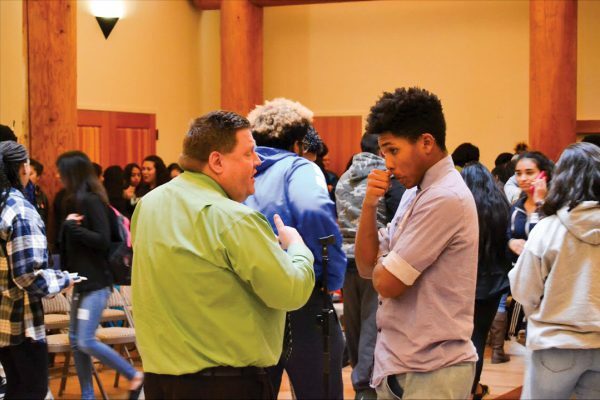 On May 26, students representing six high schools in the Eugene-area listened attentively as Scurlock shared the rationale behind the gathering. Scurlock reminded the group that in order to look forward, we must also look back. Scurlock acknowledged the many dedicated adults who made it their life’s work to support young people’s success. Looking around the room, she named state senators, city council members, superintendents, school board members, police officers, and community organizers who were in attendance. “All of these people are here because they care about you. They want for you to get the most out of your education so that you too can become community leaders and lift up those who are coming up after you,” Scurlock says to her students. 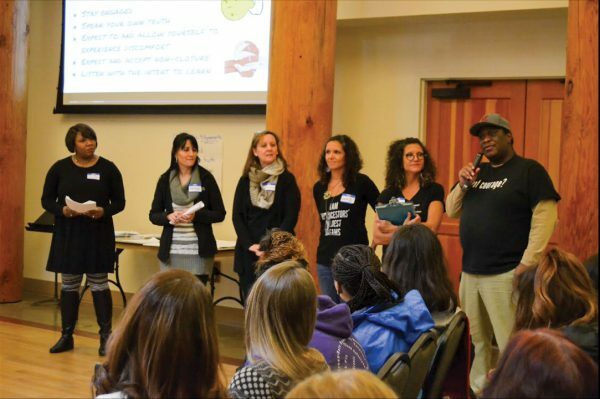 Each of the three 2016-2017 Town Hall Symposiums, held October 26, January 13, and May 26, have been facilitated by a core team of educators leading the various pieces of the Lift Every Voice curriculum that they co-created. With Jennifer Scurlock at the helm, members of this team include sisters Rena and Leah Dunbar, Kevin Summerfield, and Imelda Cortez, all teachers from Eugene 4J School District. Each brings a distinctive voice and perspective and has built deep, personal relationships with many of the students and families in the room. Their combined testament demonstrates the need for more culturally-responsive educators of color in the profession. James Florendo, coordinator of the Native American program at Lane Community College, opened with some guiding words, reminding all the participants of their inherent connections to one another and to all things. Since many students attending the symposiums are meeting for the first time, facilitators lead them through some low-risk ice-breaker activities. These encourage the students to value their own, and each other’s, stories while also building a sense of connection and safety. While debriefing this activity, Summerfield pointed out that some of the shared examples were from the time of legal slavery. “The question parents were confronted with on a daily basis was, ‘How do we keep our children safe in a society that doesn’t value them?’” Summerfield continued, “One way was to create ‘coded language’ or ‘cautionary whistles’ that only people within a certain group would recognize. These small things enabled us to keep one another alive.” As Summerfield shared this reflection, students and adults around the room nodded their heads in understanding. The Town Hall series leadership team includes, from left, Jennifer Scurlock, Imelda Cortez , Catherine Kotlarek-James, Rena Dunbar, Leah Dunbar, and Kevin Summerfield. Facilitators laid out a series of definitions for words like “prejudice”, “bias”, and “institutional racism” in order to create a common language for these conversations. NEA's Senior Programs specialist Aaron Dorsey engages the audience in a discussion on school-to-prison pipeline at the January Town Hall meeting. NEA representatives Kevin Gilbert and Aaron Dorsey presented facts and data about institutional racism and how it is manifested in the “school-to-prison pipeline”. The information provided illustrates the disproportionate numbers of office referrals and suspensions for students of color, and how this leads to higher dropout rates in Black, Latino, and Native populations. “For every out-of-school suspension, the risks of a student dropping out double,” Dorsey said. And it isn’t only students of color who are experiencing this. 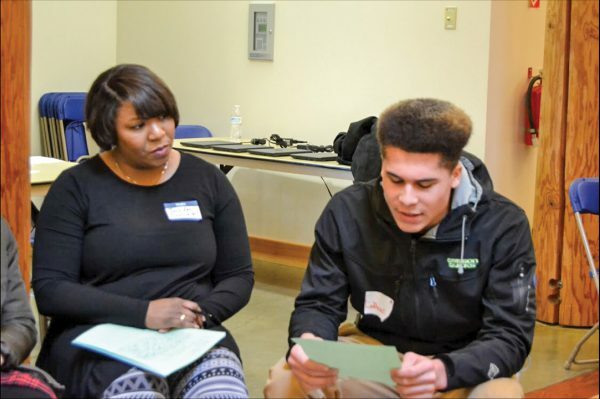 At the Jan. 13 Town Hall, students were given time to write about their personal stories dealing with racism. Students shared these stories in pairs, and then in groups facilitated by teacher leaders. Attending students were given the opportunity to share emotionally-charged personal stories dealing with racism in small groups facilitated by team leaders, some even choosing to speak to the whole room. One young man of multiracial descent spoke about working so hard to avoid being the “stereotypical black man”, so much so that when he got into trouble, it devastated him to his core. Tears streamed down his face as he shared how he felt that his entire personhood was irreconcilably damaged. Just to be able to tell this story was a healing experience for this young man, and everyone who listened. Listening to some of the experiences of these students was painful at times, but there were also some who showed amazing resilience in the face of adversity. One young African-American woman said, “They can put me down all they want, but they can’t break my spirit. I am Black and I am proud! That is how my mother raised me,” inspiring cheers from the other young people in the room. 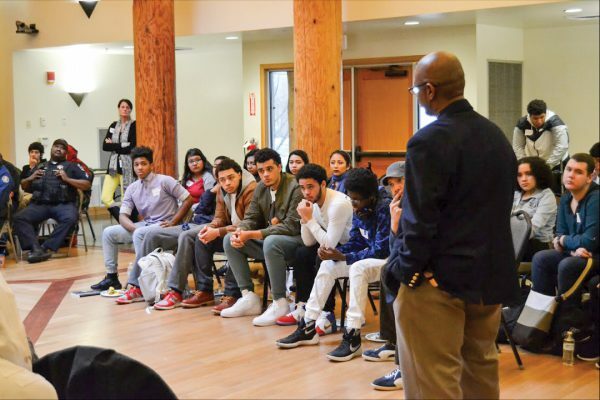 After Oregon Senator James Manning’s keynote speech at the May 26 Symposium, Kevin Summerfield facilitated a panel of eight elders of color, asking each of them the questions, “What were some early challenges that you faced with racism? How did you overcome them? And what would you say to your 16-year-old self if you could talk to them today?” Each person on the panel shared heartfelt stories about their experiences with racism as a young person, and what helped them to remain strong. When asked about the most important or memorable part of the day, several students said that they would remember the panel most. OEA Vice President John Larson engages a student about institutional racism and definitions of prejudice and bias during a break time. Jennifer Scurlock, a recently appointed NEA Director, seizes every opportunity to share highlights from the three Town Hall Symposiums held in Eugene. Her enthusiasm and the success of these events has sparked an interest across the state. At the May 26 event, a group from Barlow High School in the Gresham-Barlow School District attended, including their science teacher, Amanda McLeod. “After the election, race issues were coming up frequently in our school. Students of color were being targeted. They were being told to go home, that they were going to get deported. This was not okay. A group of us teachers decided to start having conversations about what we could do,” McLeod says. The “Lift Every Voice” movement is spreading. Our numbers are growing, our connections becoming deeper, and we’re standing together against institutional racism in our schools and in our world.